If there is a name that is synonymous with Swedish melodic death metal, it has to be the one and only At The Gates. Known as one of the forefathers of what would become Swedish melodic death metal, At The Gates set a benchmark with their iconic 1995 album Slaughter Of The Soul, a release that would be an inspiration for a myriad of acts to follow and try to replicate, yet seldom duplicated. 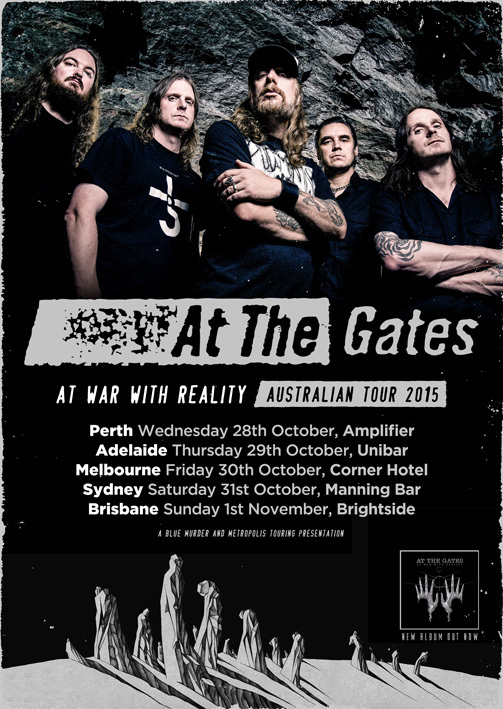 When they reformed in 2007 after an 11 year hiatus, they toured the world on a highly successful reunion tour (with a stop off in Australia in 2012) that culminated in the band writing and creating a new album in 2014 entitled At War With Reality and now At The Gates will be returning to Australian shores in October! On the live front, there is truly nothing like hearing Anders hit that intro riff to Slaughter Of The Soul and a packed crowd shouting “GO!” at the top of their lungs sending the pit into an absolute frenzy from beginning to the end without any sign of slowing down. Time and time again, At The Gates prove why they are one of the undisputed kings of the genre and then some. Instead of wasting your money on one of the imitators, see the innovators lay waste once again. Tickets on sale Mon 27th March.